Krysztoff Wodiczko belongs to a genre of public artist who meld art with science and technology. He is a member of MIT’s Interrogative Design Group and is internationally renowned for his large-scale slide and video projections on architectural facades and monuments. Since the late 1980s, he has developed a series of nomadic instruments for both homeless and immigrant operators that function as implements for survival, communication, empowerment, and healing. In 1992, Wodiczko began Xenology: Immigrant Instruments, tools for “the immigrantÕs art of survival.” In the forms of a staff (Alien Staff), wings (Aegis) or a mouthpiece (Mouthpiece), these instruments include small LCD monitors that project an edited videotape of the wearer’s personal history. The series grew from Wodiczko’s own experience as an emigre. Born and trained in Poland under a socialist regime, Wodiczko settled in Canada in 1977, before moving to the U.S. in the 1980s. 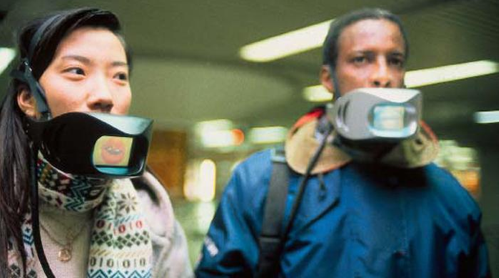 Created to be performed in urban centers, Xenology: Immigrant Instruments such as Mouthpiece opened dialogues between their operators and passersby, stimulating communication between the immigrant (the speechless stranger) and the native community. 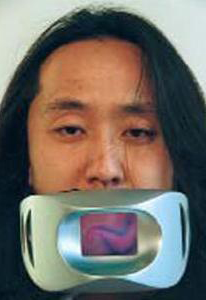 This object encircles the jaw with a small video monitor and loud speakers placed directly over the wearer’s mouth, showing the lips moving in sync to the prerecorded narrative. It is designed to replace the hesitations and fearful silent of an immigrant’s personal voice with a fully formed version of the immmigrant’s story. It function both as a conduit of ones’ voice and image as well as a gag that blocks the mouth and prevents from speaking.